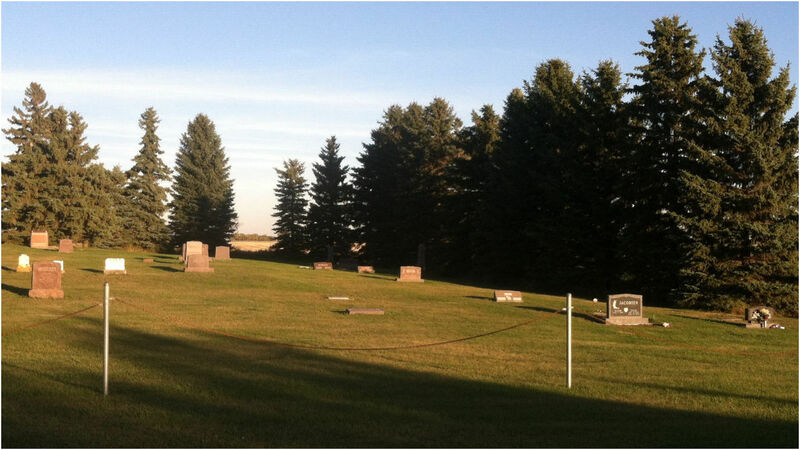 The Flaxton Rural Lutheran Cemetery is down the road from the Nygaard Farm, just a little over a mile north of the city of Flaxton, North Dakota, on Burke County Road 13, which is sometimes known as 77th Avenue NW. In early June of 1902, Marion E. Baker, a local landowner and farmer whose residence was about a half-mile south of the Cemetery, sold to the Flaxton Danish Evangelical Lutheran Congregation three acres of land for $60. (Click here to see a copy of the deed in Volume 26, pages 292-293 from the Burke County Recorder's Office.) On this land to the north of the Cemetery, the Congregation built a church which was dedicated December 1, 1907. The church was dismantled in the Spring of 1958 but the church's outhouse still stands. And, of course, the Cemetery is still there. The plan drawing of the Cemetery shown below was done in 1924 by Jens P. Andreasen, who was the minister of the Congregation from 1923 to 1933. "Kort Over" is Danish for "Map," "Menighed's Kirkegaard" means "Congregation's Cemetery," and "Sydlige Halvdel" is "Southern Half." "Kørevej" means driveway, "gangbro" is walkway and "nord" is north. "En Sec." is a section and "En Lod" is Danish for a portion. Numbered stone markers were put into the ground in the mid-1970s by the Flaxton Rural Lutheran Cemetery Association which today has responsibility for the Cemetery and its upkeep. Locations of the numbered stone markers, headstones, footstones and metal markers were measured and photographed from mid-May through July, 2013; new additions were measured and photographed in the summers of 2015 and 2017. Click on a person's name on the blueprint below or on a name in the alphabetical list below the blueprint to see that person's headstone or marker. For other information about burials in the Flaxton Rural Lutheran Cemetery you can go to FindAGrave.com.